The World's Resources Institute has produced a Google Map to highlight coral reefs around the world that are currently under threat. A KML of the data is also available to view in Google Earth. March 8th will be the centenary of International Women’s Day. To celebrate the occasion people will be coming together on bridges all over the world, from the Millennium Bridge in London, the Brooklyn Bridge in New York City, the Golden Gate Bridge in San Francisco, to the Grand Barriere Bridge joining Rwanda and Congo. Google is collaborating with Women for Women International on their 'Join me on the Bridge' campaign. Part of this collaboration includes this Google Map to help you find a bridge event near you, register, or create your own bridge event. Bergens Tidende have mapped the Norwegian Public Roads Administration’s database of road accidents. They have used Google Maps to plot 11,440 accidents to help give an overview of the extent and causes of Norwegian road accidents. Each map marker contains details about the accident, i.e. time of day, type of vehicle, age of persons injured etc. Beneath the map are a large number of filters that allow you to create your own assemblies. It is possible to view the data by year, time of day and by age. It is also possible to filter the results by the day of the week, speed limit, types of road and a number of other factors. Maps-For-Free has produced a nice Google Maps application that lets you view a number of relief map layers. Not only can you use the application to view the relief maps you can add them to your own Google Maps. Maps-For-Free offers free relief maps and other additional layers which can easily be integrated into your own Google Map projects. A drop-down menu at the top of the map lets the user select from a number of relief map layers, including forest areas, swampland, tundra and many more. The application also includes a nice snapshot tool that allows you to define an area of the map and grab a still image. Room 77 uses Google Earth to show you the view from hotel rooms across America. That in itself is enough to make it one of my favorite maps of the week. However Room 77 also includes an excellent ranking system for hotel rooms based on individual preferences for view, floor, distance from elevator and connecting rooms. Two really great Google Maps games make it into my Sunday Best this week. Crazy Boat impressed me greatly with their use of map styles with the Google Static Maps API. The game is fun to play as well! This isn't the first zombie game I've seen that uses Street View. But it is probably the best. Great and intense zombie avoiding fun on Facebook. If you are putting the washing out on the clothes-line then you might want to turn on Rain Alarm. Leave Rain Alarm on in the background and get a warning when it is about to rain. iheartmyyogi allows you to search for yoga teachers throughout the world from a Google Map. It is possible to select a country from a drop-down menu, enter your postcode and select which yoga styles you are interested in learning. The results are then shown on a Google Map in a radius from your selected location. When you view the details of a teacher you can click on the teacher's location and then view the driving directions from your home or office. If you register as a teacher, you can set your location by entering your address. iheartmyyogi will geocode your address and allows you to fine tune the location directly from the map. Last the week The Guardian published a Google Map mapping the newspaper's travel videos, called Video Breaks Around the World. This week they have created a Google Map highlighting the best city hotels in the world. So far the paper has mapped out the best hotels in 32 cities across the world, 'hand-picked by locals and experts from San Francisco to Beijing'. The Guardian says it has plans to add more cities to the map in the future. You can select to view a city's hotels from the drop-down menu in the map sidebar. If you then click on the individual hotel markers you can read The Guardian's review. Zombies have taken over the world and, unlike in the movies, they seem to be able to run really fast. To survive you will need to outpace the converging hoardes of the undead in Google Maps Street View. As you run around the streets in Street View you can view the approaching zombies in the inset Google Map. To stay alive you will need to outsmart them and avoid becoming trapped. PacMap from AppBrain - Play Pacman on real streets with this Android app. Room 77 can help you book the hotel room with the best view. Using some pretty smart algorithms Room 77 is able to show you the view from different hotel rooms using images captured from Google Earth. Using Room 77 you can check out the views from rooms in hotels in a number of US cities and in London. To show you the view Room 77 calculates the latitude, longitude, altitude and orientation of the room and shows you the view as seen in Google Earth. User submitted photos are also shown where available. Room 77 uses Google Maps with an overlay of the hotel to allow you to see the view from different rooms within each hotel. The overlays allow you to select different room numbers and even allow you to select different floors in each hotel. Room 77 even has its own ranking system for hotel rooms based on your individual preferences for view, floor, distance from elevator and connecting rooms. Each room is then shown on the Google Map with a color-coded match percentage indicating: "strong match" (green), "fair match" (yellow) and "weak match" (red). Google's satellite imagery update in London last week includes this amazing shot of an aircraft flying over Russell Square. Aus Hadeln left a comment to say he had also found this image of a plane approaching Heathrow in west London. Travelling east along the same flight path, approaching Heathrow, I found this plane. The tragic news from Christchurch this week has ensured that everyone knows the location of New Zealand's second largest city. Or do they? The Map Game asks you to find locations on a Google Map. Well actually not on the map, as that would be too easy, but on Google Maps satellite view. So do you know where Christchurch is? Artist Ben Joyce's paintings are inspired by the interesting satellite views he finds on Google Maps and Google Earth. Google liked his work so much that they recently asked him to show his work at their offices at Mountain View. Artinfo have a nice slide show of Ben's work. Two Google Maps of the Libyan protests have been receiving a lot of press in the last few days. Mapping Violence Against Pro-Democracy Protests in Libya. The map has been created by compiling reports from trusted accounts on Twitter. Arasmus says that each posting on the map is considered carefully before it is mapped. Arasmus seems to be working very hard to keep the map up-to-date and has been assiduously adding the latest news to the map for over a week now. Mibazaar's Middle East Protest Map lets you view the latest Twitter messages from the Middle East. The map animates between the latest messages to be posted to Twitter from the Middle East. It is possible to view Tweets from the entire region or to select to view only Tweets from Bahrain, Egypt, Libya or Iran. The Tweets are displayed at geotagged locations on the map at an interval of 5 seconds so the map provides an impressive means to view real-time updates across Libya. In the US The National Telecommunications and Information Administration (NTIA) has released a National Broadband Map. The map allows users to search broadband availability across the United States and compare real download speeds to advertised broadband performance. Users can also search by address to find the broadband providers in their area. Inspired by the US National Broadband Map SurveyMapper has decided to ask UK internet users what their fastest broadband speed test reading has been. So far the survey has received 13 thousand responses, the results of which can be viewed on a Google Map. In the UK you can also use Broadband StreetStats. This Google Map allows you to compare broadband speed and providers at your address. The map shows individual speed tests in your area undertaken by individuals on Top10.com. New Zealand's National Broadband Map uses Google Maps to present broadband supply and demand data. Using the map it is possible to search for demand points and view the network suppliers throughout New Zealand. In Canada, Industry Canada uses Google Maps to show which internet service providers are available. Users can search the map by address and view the available broadband providers. If the data is incomplete for a particular address users can complete a short form to add information to the map. Moonshadow Mobile have released a great Google Maps application to visualise the 2010 New Jersey census data. This application visualizes some five million records. Using the application you can set filters, colors and generate heat maps. You can display census block lines, as well as County lines, Congressional, State House and State Senate districts. You can even zoom down to the census block level and download the actual census data for a block. The Census Bureau will be releasing data for each state over the next five weeks and Moonshadow Mobile plan to publish Google Maps applications to visualise the data for a number of the states. Map comparison sites always seem to be very popular. One of the most popular searches on Google Maps Mania seems to be for sites that let you view the different online map providers side-by-side. Buncha Maps is a new application that lets you view Google Maps, Bing Maps, ESRI Maps and OSM all in the same window. Actions in all four maps are synchronised, so if you pan and zoom in any of the maps the other maps will also show the selected view. This map places Bing Maps' Bird's Eye View side by side with Google Maps' Aerial View. You can view a number of locations with both map providers' oblique views. Where's the Path displays Google Maps alongside the corresponding Ordnance Survey Maps. 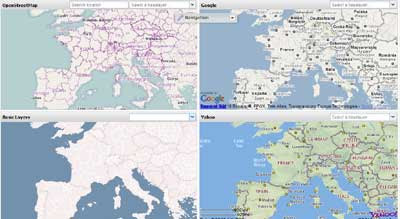 GeoTrubu also has a comparison of Google Maps and OpenStreetMap and also shows Yahoo Maps and Bing Maps. The site allows you to select the base layer for each map. The creators of SundayMorningRides have launched a new website designed to showcase beautiful motorbike routes. The site uses Google Street View to provide a first-person experience of these great bike journeys. Each day the site features a different route selected for its scenic qualities. Each route also includes an elevation profile and a Google Map. Detailed information, GPS file downloads and user testimonials for each route are provided via direct links to SundayMorningRides. Sherubtse College, in the Kingdom of Bhutan, has used the Google Maps Custom Street View feature to create a virtual tour of the college campus. The map includes a number of connected 360 degree panoramas taken both inside and around the campus buildings. Using the internal links in the panoramas it is possible to take a virtual stroll around the campus, just as you would in Google Maps own Street View coverage. The map itself includes a custom overlay of the college. It is possible to adjust the transparency of the custom overlay and to select to view the indoor or outdoor panoramas. UK crime data has been added to SpotCrime and MyLocalCrime. The UK recently launched a national crime map for England and Wales called Police.uk. This data is now available in SpotCrime and MyLocalCrime. Using both services it is possible to search for a UK address and view the latest crime data for the location on a Google Map. The data for a searched location is also displayed beneath the map. It is possible to click on a map marker to click through to read further details about each recorded crime. This Google Map uses the Ushahidi map reporting system to record the latest news from Christchurch. The map shows closed roads, open hospitals, recovery centres and hazard zones. Anyone can post a report to the map by sending an email to eqnzfeb@gmail.com, by sending a tweet with the hashtags '#christchurch', '#eqnz' or '#ChristchurchQuake' or by completing a short form. The Christchurch Quake Map allows you to play time-lapse visualisations of the 4,870 quakes and aftershocks that have struck in the Christchurch area since September 2010. It is also possible to view visualisations of the last seven days of quakes or the 47 that have hit today. The Google Maps plot earthquake data from GeoNet. The animations show the epicentre of each shock and are colour-coded to show the depth of each quake and scaled to reflect the quake's strength. Google have released a person finder application for today's Christchurch earthquake. Using the application it is possible to search for information or add information for someone who may have been affected by the earthquake. GeoGarage Marine, the portal to international marine maps, has added 227 marine charts for the Netherlands. GeoGarage uses Google Maps to display marine charts from around the world. The site currently provides marine chart overlays from NOAA (US), DHN (Brazil) and Linz (New Zealand). Marine GeoGarage's web interface also gives subscription members access to all private charts from the UKHO (UK), CHS (Canada), SHN (Argentina). The Pacific Trash Vortex has reached critical mass, flooding nearby seas with strange and valuable debris. A new age of sea entrepreneurship has arisen. Can you man your rusty old boat and save the Pacific Ocean from the floating debris of the Trash Vortex ...? I've been waiting a while for someone to come up with an interesting use of the Google Static Maps API Styled Maps feature. It was definitely worth the wait. This Facebook game makes great use of the Google Static Maps Styled Maps feature and HTML overlays with real latitudes/longitudes to create a realistic backdrop for your challenge to clear the Pacific Ocean of the Trash Vortex. Echo Team has called upon some of the greatest mid-century American action serials to make a game that both harkens back to the adventures of yore and puts a new face on the idea of exploration, with an emphasis on the environmental impact of what reckless exploration means to the planet at large. Crazy Boat uses your Facebook profile data to give you in-game bonuses for your real-world skills and strengths. If you you post messages about the game to your Facebook wall, you might earn the Forest Ranger skill, and if you post about current events, you might score points as a Politician. 5% of the in-game revenues go to benefit Project Kaisei, a non-profit organisation dedicated to cleaning up the real Pacific Trash Vortex. If you live in Ottawa, Canada then RepresentMe can help you find out who your elected representative is and what they've done lately. When you enter your postcode RepresentMe will display your electoral ward on a Google Map and tell you who your Member of Parliament, Member of Provincial Parliament and City Councillor are. RepresentMe also displays the recent activity of your elected representatives, including their recent voting record and mentions in press articles. This Google Map based application will send you a warning when rain is approaching. Rain Alarm displays an animation of current precipitation and can warn you against approaching rain or snow. The app checks a perimeter of 75 km around your selected location every 30 minutes. If rain is approaching your location the map will then sound the alarm. The app is currently available for the USA, Canada, Australia, the UK, Ireland, Norway, Germany, the Netherlands and Spain including the Balearic and the Canary Islands. NSW Suburbs: What's in a name? Did you know that 227 towns in New South Wales are named after UK towns? Well this double Google Map shows you all 227 NSW towns and shows you the location of their namesake in the UK. The towns are displayed on both Google Maps and listed in the map sidebar. If you click on a town name in the sidebar both the New South Wales and UK map will centre on the chosen town. If you want to produce a similar map for the namesakes of US towns you can view the code for the map at github. Alternatively you could create a dual map showing the cities/towns other cities/towns were twinned with. Rally-Maps, the rally web portal, uses Google Maps to show the locations of rallies all over the world and allows users to place their rally videos on an on-line map. The site has recently released a number of new features. One of these new features is the synchronisation of rally videos with Google Maps. This example lets you view a video of the 2011 Sigdalsrally, with Kjær Motorsport's Subaru Impreza group N rally car. As the video plays the car's position is shown on the Google Map. The video is truly synchronised with the map, if you pause the video the car's movement on the map will pause and if you select a different time in the video the map will also update automatically. It is easy to forget what a great mapping tool Google My Maps is. Even without programming skills you can use Google My Maps to create a great Google Maps application. This map from The Guardian newspaper is a nice example of what can be created with My Maps. The map showcases The Guardian's travel video collection, from taxi driver tours of Buenos Aires to atmospheric backstreet workshops in Istanbul. The map uses custom map markers and allows you to view The Guardian's travel videos directly from the map. So. if you have a little time this weekend. you can while away the hours with a little sightseeing from the comfort of your own home. The Cricket World Cup started in India today. Mibazaar has stepped up to the wicket and produced this World Cup Twitter map. The map animates through the latest Tweets mentioning '#cricket'. It picks up all such Twitter messages sent from India, Pakistan, Bangladesh and Sri Lanka. At the time of writing India are setting about Bangladesh with a vengeance and are looking to establish a huge target for Bangladesh to chase down. Judging by Mibazaar's map this is going down rather well with Twitter users in India. Using the map it is possible to see what events are going on in your area and who will be going. It is possible to search the application by date and location. It is also possible to see how many people are attending the event and how many of them are male and how many are female. iHear Network is a free mobile application for Android that lets you visit any location in the world and hear commentary from people in those locations as they post their experiences to the web in real-time. Using a Google Map it is possible to let iHear find your current location or search for any location in the world. Once you have set your location the application then reads out the nearest geo-tagged content from Twitter. It is possible to adjust the radius of the area you wish to hear messages from. It is also possible to select to hear "New Tweets Only". iHear is a great idea for a geo-location Twitter application. Using the application it is possible to zoom in on locations around the world, for example try Tahrir Square today, and hear the latest real-time Tweets coming from that location. I can't help feeling however that iHear are missing a trick by not letting you sign-in with your Twitter account. It would be nice to be able to filter out the background 'Bieber' noise and just listen to the latest Twitter messages from my Twitter friends. This Google Map shows the top 100 websites in the world by location. The map displays the 100 most popular websites in the world according to unique user counts (source Google). The websites are organised by category, for example 'social networks', 'video' etc. It is possible to search the map by location or use the links at the bottom of the map to search by category. A really nice feature of the map is the clustering of the map markers. Not only does each clustered marker show the number of markers at the location it features a nice pie chart that represents the percentage of each website category at the location. In a post on Google LatLong Phil Verney, a Program Manager at Google Earth & Maps has hunted down some of the Street View images of locations used in the movie Love Actually. 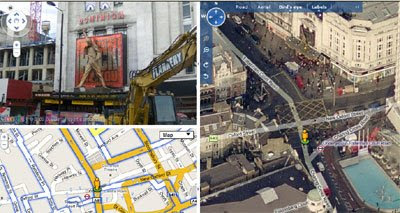 TheMovieMap is a Google Maps mash-up of movie sets and filming locations. 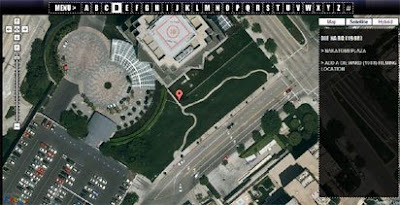 The location of each film can be viewed in Google Maps satellite view. Clicking on a tag reveals a brief description of the film and the location, photos and external links. It is possible to add new movie locations to the map by completing a short form. To celebrate the Summer of British Film season on the BBC the Culture Show team visited classic film locations around the UK. To accompany the television programme the BBC released this interactive Google Map of film locations. The map includes fascinating stories about iconic locations and exclusive film commentaries by critic Mark Kermode. 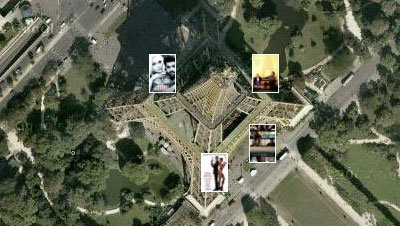 Filmaps is a film locations website that also uses Google Maps to show the locations of movies. Filmaps want to help movie fans find the locations in their favourite movies. Italian newspaper la Repubblica created this Google Maps mashup covering some of the locations in the movie New Moon. Part of the film is set in the picturesque Italian town of Volterra. The map markers show some of the film's locations and include photographs and extracts from Stephenie Meyer's original novel.